This is one dish which any kid will fall in love. 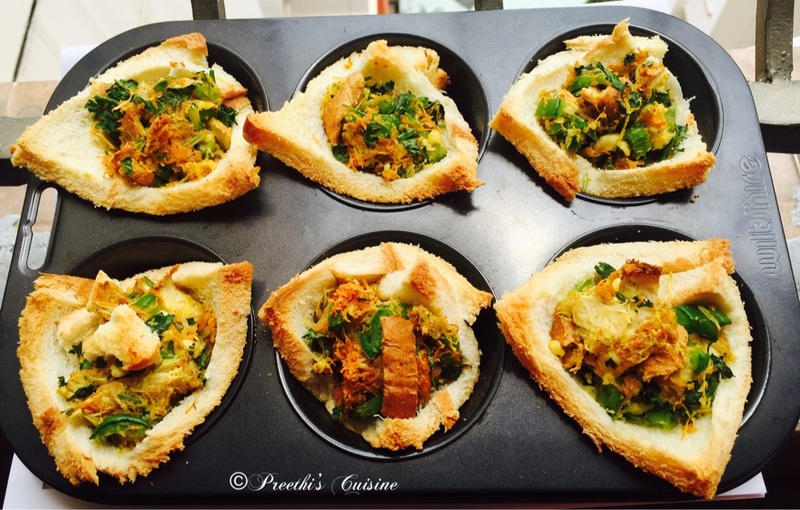 Even a fussy eater will be tempted to eat these stuffed bread cups. 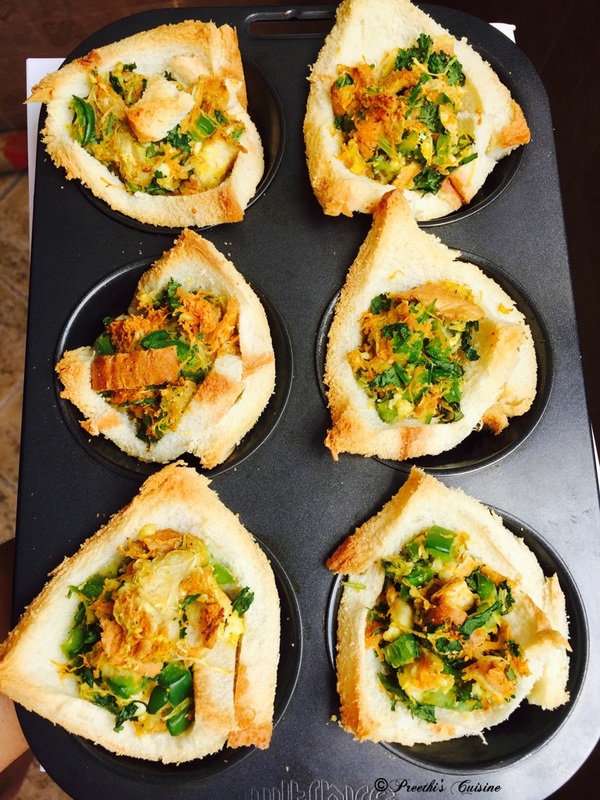 Loaded with Proteins and Vitamins , these stuffed bread cups are easy to make and filling too. You can change the stuffing as per your taste. This is one way to get your kids to eat healthy and nutritious food. It is a daunting tasks for many mom every day to feed their fussy kids. I am sure this recipe will be loved by all the kids and mom’s too as it is nutritious and easy to make. Mix all the veggies, grated paneer, chaat masala, Coarsely ground Pepper and chopped Coriander Add salt just before stuffing. Mix well. Take a muffin tray and grease it. Pre heat the Oven at 180 C for 10 minutes. Fold the bread slice in the shape of a cup and place it in the muffin tray. Fill the stuffing in the centre and generously sprinkle cheese. I have added less cheese as my kids wanted it that way. Place the tray in the pre heated Oven and bake for 15 to 20 Mins. 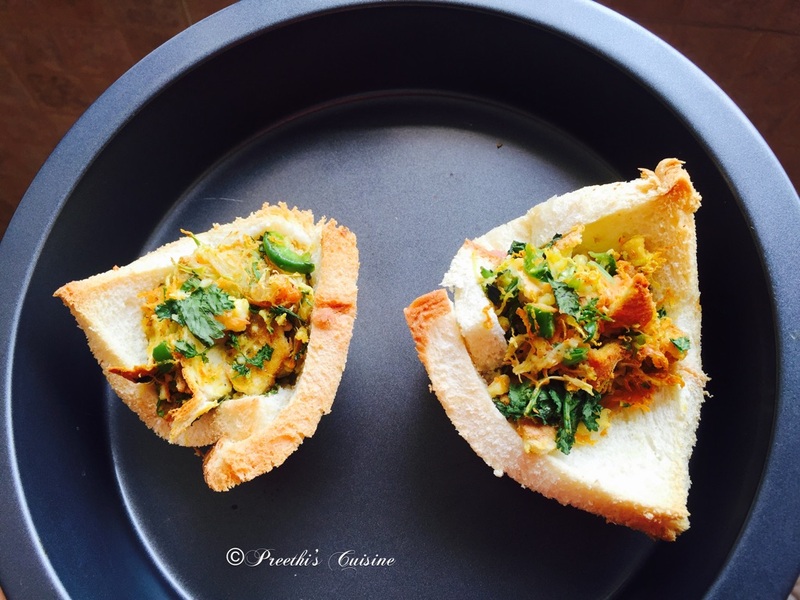 Crispy Stuffed Bread cups are ready. Serve hot with Sauce or green chutney.